This part of dressing your body can be less than fun. Unless you are the perfect hourglass shape, some of the other ones are less flattering, but it really does help to know. Have you ever spent hours in dressing rooms, trying on clothing article after clothing article and nothing looks good? Maybe you’re looking at the wrong kind of clothes. Knowledge is power… and cute clothes that fit right. Stand in front of a mirror in your undies and be brutally honest with yourself. It might save you some stress in the dressing room later. Hourglass figures have the same size hips and shoulders, with a well defined waist. You have an hourglass figure if the fullest part of your hips and the fullest part of your bust are the same width and your waist is well defined. Hourglass figures most likely have a “balanced” vertical body shape. Marilyn Monroe has the classic hourglass shape. Inverted Triangles are proportionally large busted or have broad shoulders, sometimes both. They also have narrow hips and a well defined waist. Typically, inverted triangles are a long leg vertical body shape with proportionally slim legs. Hayden Panettiere has the broad shoulders and a narrow waist of an inverted triangle. The triangle body type is also called the pear-shaped. The fullest part of your bust is proportionally narrower than your fullest part of your hips and you have a well defined waist. Many triangles have narrow shoulders and full thighs. Typically, a balanced or short leg vertical body shape accompanies a triangle shape. Scarlett Johansson is the common pear shape, with more weight below the waist than above. Rectangle bodies are about the same width at the fullest part of your bust and the fullest part of your hips, but there is little waist definition. Legs and arms are typically slender. Bust may be small to medium in size. A balanced or long leg vertical body type often accompanies a rectangle. Rectangles often look shorter and wider than they really are, which is why wearing clothes that fit is so important. Take out any extra bulk! Rectangles may have been hourglasses when younger or slimmer. Cameron Diaz has a rectangular body shape. Her hips and shoulders are similar in width and her waist doesn’t have a lot of definition. Shirts with minimally padded shoulders. Shoulders pads should not be visible. Just enough to add some curves. Oval bodies are often called apple-shaped. Ovals have the overall appearance of being round, especially around the waist-line, as the waistline is undefined. Ovals may have a large, low stomach and love handles. The upper thighs are usually full. Diamond shapes have the same qualities, but they carry their tummies high, rather than low. The tips are the same though. 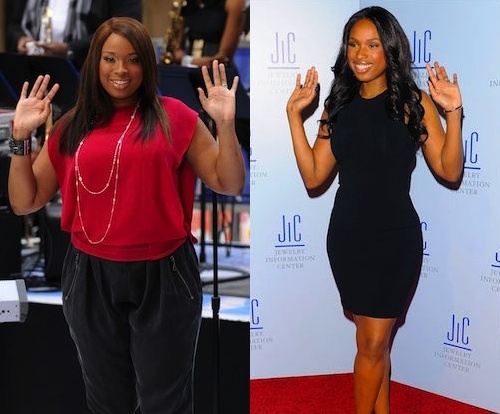 Jennifer Hudson has an apple shaped body. Apples aren’t necessarily “big” girls. Jennifer Hudson has maintained her apple shape even with all the weight she’s lost. Julia Roberts and Angelina Jolie also have apple shaped bodies. Body shapes change as we age, gain weight, lose weight, take up new lifestyles and exercise habits. Just because you fit into one shape now, doesn’t mean you have always been that shape, or always will be. All body shapes are beautiful. Knowing how to choose the right clothing will help you accentuate the great and draw attention away from the not so great. This is a great synopsis. I’m either an inverted triangle (broad shoulders) or a rectangle – no waist definition. Thx! I am a pear, and let me tell you: I wore a clingy dress, and it was AWFUL! I got rid of the dress. I looked like I was wearing a moo-moo. Just terrible! Too bad I didn’t have this post BEFORE I made that fashion mis-hap! Great explanations and pictures! Living So Abundantly: New meme starting tomorrow, July 7, 2011, Give Back Thursday–come join the fun! Good advice and the part about body types changing is so true! Thanks. Those are really good tips. Wish my shape was an hourglass. Maybe you could do a post on face shapes too. I enjoyed reading this! I’ve struggled with my post 4 kids body shape. This lead me in the right direction until I get the unwanted pounds off to return to an hourglass…. if it ever happens! Oh thank you so much for sharing this (and providing examples). I never know where I fit into these categories, but I have a better idea now and know how to target my shopping! Thanks! Great Post! I never can figure out my shapes whether it’s face or body. Hi There! New follower from the hop. Would love it if you could hop over to http://www.girltechdivas.com and follow back! Thanks for sharing this bit of information. I enjoyed reading it.